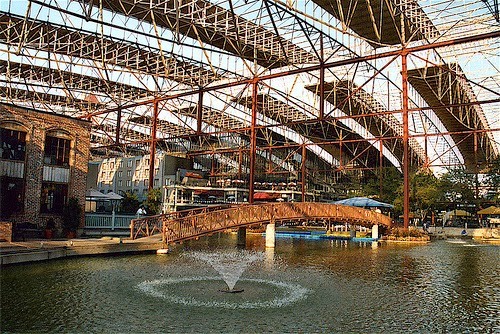 Let’s take a trip in the Way Back Machine (not to be confused with a Hot Tub Time Machine), and let me tell you about my vacation in Missouri over the Christmas holidays of 2001. I had decided to come home and go back to college full time after bumming around on walkabout for 5 months (a topic for another post! ), and when my first Christmas break came around, I decided to take the opportunity to visit my eldest sister and her brood, who were all living in an awesome turn of the century farmhouse in the farmlands of Butler, Missouri. I had another reason for travelling all the way to Missouri, and that was to visit a couple of good friends of mine living in St. Louis over the New Year holidays. Killing two birds with one stone, so to speak. The family visit portion went well, and then I packed up again a few days before New Year’s and took the Greyhound across Missouri to St. Louis, a city I had never visited before. Hoo boy. Quite the difference from the quiet, windswept farmlands of rural Butler, and waaay more intense than my well-known streets of Toronto; it was honestly like visiting another world, not just a city in another country. 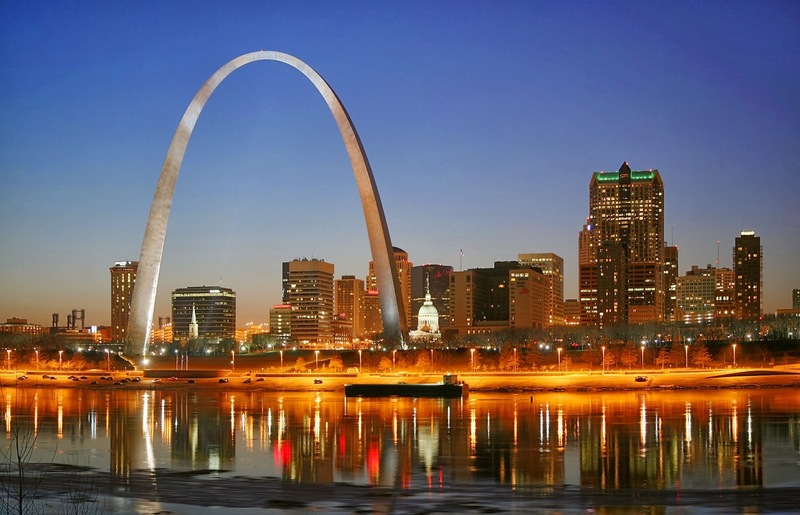 I must say, with all of my travelling around much of the world, alone and with friends or family, I never felt as exposed and vulnerable as I did in St. Louis. At that time, the bottom had fallen out of the tech stock market, and there was a lot of unemployment in the United States. Where my friends lived was in a formerly nice but now run-down neighbourhood, with every fourth house boarded up or otherwise vacant. My friend proudly told me that his own house had been purchased as-is from a government auction; I think he may have paid $25,000 for it, with a ridiculously long (at least for the time) 30+ year mortgage. At that point, vacant houses were such an epidemic I have the feeling that the city would have practically given the houses away just to have tenancy. So anyway, back to the story. I went to visit my friends over the New Year’s break with their hearty welcome; then, as can happen when you work in the restaurant industry (they were chefs, I believe), plans changed and they were given a rare opportunity to have NYE off from work. Which of course they wanted to spend together. Without me. Well, being the nice, polite little Canadian that I am, I offered to go to a late movie and let them have some private time together. They were relieved that I wasn’t (outwardly) pissed at them, and thanked me profusely for giving them some time together. So, with directions and some bus money in pocket, I went off in search of adventure! Yes, I am as dumb as I sound. 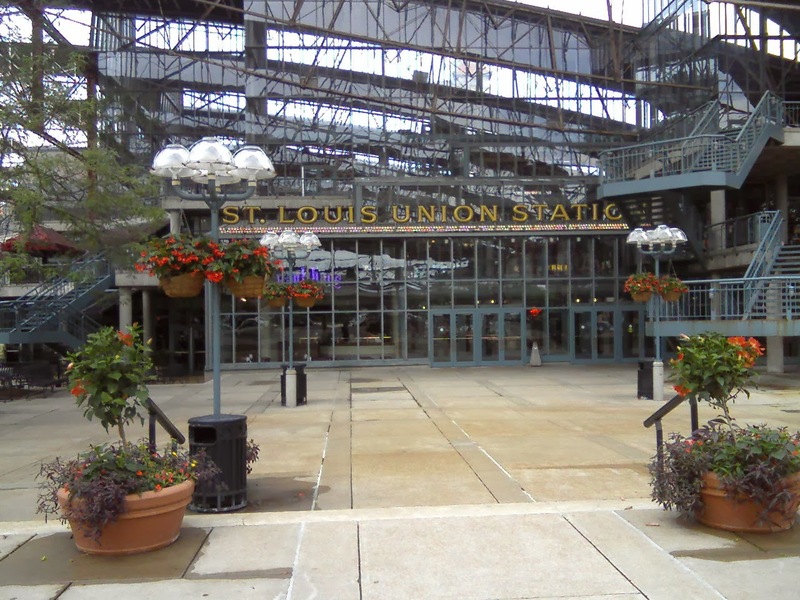 I ended up visiting an Oldey Timey mall that was once St. Louis Union Station, and arrived alive and everything! had a lovely, if slightly lonely time lollygagging around for several hours, looking at the pretty things in the windows. Very nice mall, actually, even if I couldn’t afford much. 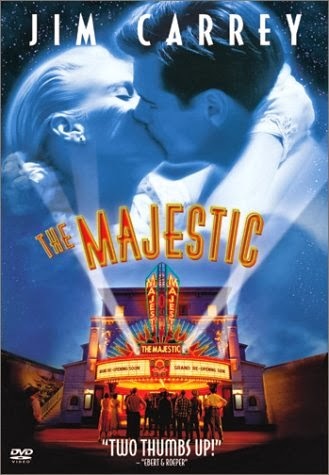 The only movie playing in the nearby theatre which I was even remotely interested was a Jim Carrey flick called The Majestic, which happened to be late enough that it ended close to midnight. And yes, I was practically the only one in the theatre, if memory serves. Whatevs. The best part of the story: on my way back home to my friends’ house on the public bus, of which I was one of only a few passengers, I was surprised halfway through the trip when the bus driver suddenly turned off the interior lights in the bus as we rode along the streets. Before I could ask why he did this, his apologetic voice came over the speaker and explained that it had just turned midnight (“Happy New Year!”), and, due to previous, erm, “incidents”, he would be leaving the lights off in the bus until further notice, as it wasn’t unusual for excited NYE revelers to not only shoot off fireworks but REAL GUNS, and he felt it would be safer for all of us if we weren’t lit up like spotlights for some drunk fool to be using our heads in the windows for target practice. Oy vey. 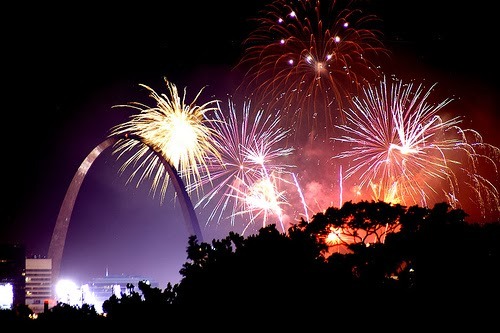 Gotta love Saint Louie. …what the mothering WHAT?!? Thanks for the heads up, buddies. Needless to say, I still love those crazy Amerikanskis, but I haven’t been back. Now enough of my blah blah; it’s time for a recipe that is uniquely St. Louis! Most people talk about iconic STL recipes like their ribs, or their pulled pork, or something called SNAHTS which I don’t even care to think about, but I thought I’d showcase something a little different but no less lip-smacking good: St. Louis Toasted Ravioli! 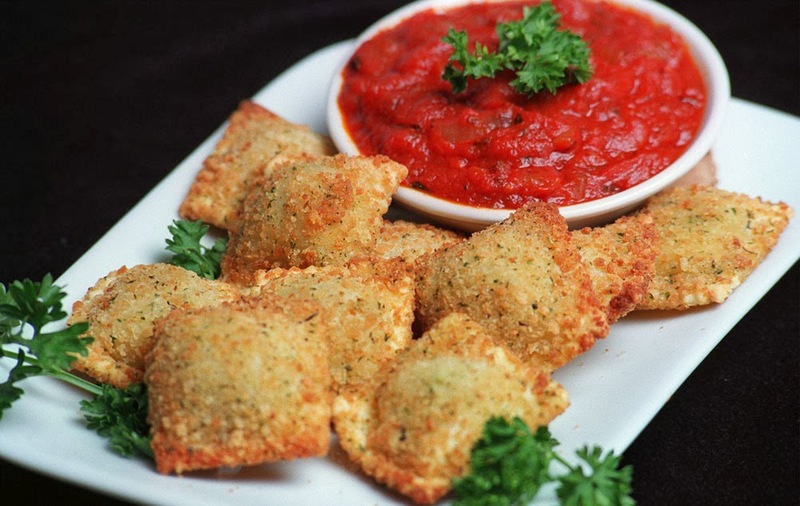 Misnomer #1: They are not toasted, but deep fried in oil, and #2: ravioli are an Italian invention. But, once you get past those little inconsistencies, you’ll be glad you tried them. I must say in all honesty, I did not have the opportunity to order these when I was down in St. Louis (too busy dodging bullets I guess), but I have made a variant of these for a party before, and let me tell you they are DELICIOUS! In a large heavy pan, pour oil to depth of 2 inches. Heat oil over medium heat until a small amount of breading sizzles and turns brown. Combine milk and egg in a small bowl. Combine breadcrumbs and salt in a separate shallow bowl. Dip ravioli in milk mixture, then coat with breadcrumbs. Fry ravioli, a few at a time, 1 minute on each side or until golden. Drain on paper towels. Sprinkle with Parmesan cheese and serve immediately with hot marinara sauce.